Pour sauce into 13x9-inch baking dish sprayed with cooking spray. Stir in 1/4 cup (4 Tbsp.) Parmesan. Add chicken; turn to evenly coat both sides of each breast with sauce. Cover. Bake 30 min. or until chicken is done (165ºF). Meanwhile, cook spaghetti as directed on package, omitting salt. Top chicken with remaining cheeses; bake, uncovered, 5 min. or until mozzarella is melted. 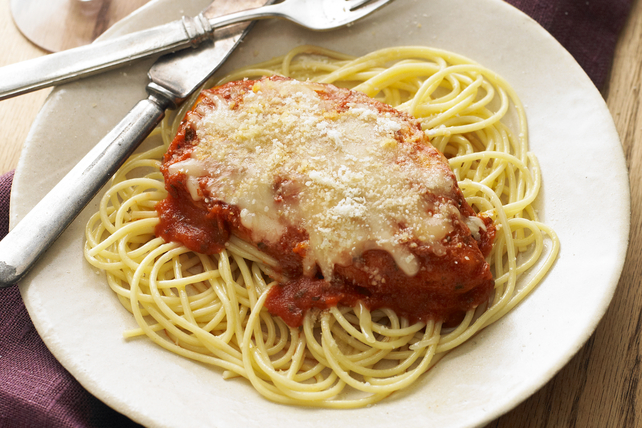 Prepare using Kraft 100% Parmesan Light Grated Cheese, whole wheat spaghetti and Cracker Barrel Shredded Part Skim Mozzarella Cheese. If using larger chicken breasts, cut lengthwise in half before using as directed.